The P3 International P4400 Kill A Watt Electricity Usage Monitor, which is available from Amazon.com for only $17.48 (a substantial discount from normal retail price of $50.00) is simply amazing, whether you use it around the house or to measure the electrical usage of computers, servers, network equipment, and peripherals. As an indication of how popular this P3 Kill-A-Watt device is, it is ranked #37 in Amazon’s Tools & Hardware category. #37 is nothing to sneeze at — out of a MILLION products in that Tools & Hardware category! And to make this an even better deal, this item is shipped and sold by Amazon itself, and eligible for FREE Super Saver Shipping on orders over $25 — and with gift-wrapping available from Amazon, it would certainly make an excellent gift! Below you can see the Watts of electrical usage of my Dell PowerEdge server used to run this (and other) websites. It shows 217 watts usage. The measurement varied slightly between 215 watts and 218 watts, I picked a median value to display below. Because the P3 Kill-A-Watt device has a NEMA 5-15P plug, I simply plugged it into my Battery Backup (Uninterruptible Power Supply) and then the server’s power cord into the P3 Kill-A-Watt. 156 kwh * $0.1359 per kwh = monthly cost of $21.20 per month to run this Dell PowerEdge server. 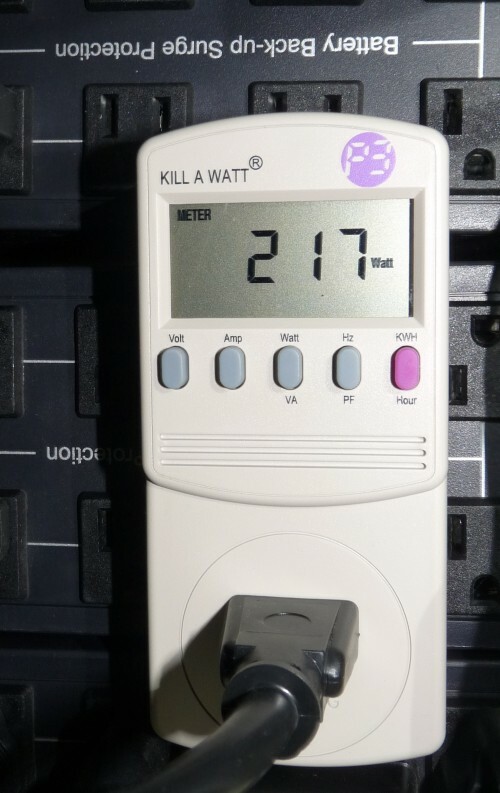 Without this P3 Kill-A-Watt device I had previously assumed that my Dell PowerEdge server with its 500 watt redundant power supplies was probably pulling in around 300 watts (typical usage, below the maximum value), it is nice to know that my actual usage is considerably below 300 watts, in the low 200’s. This entry was posted in Computer Miscellaneous, Dell PowerEdge 2650, Server/Systems Management. Bookmark the permalink.